The Eastern Cape is facing the possibility of deepening drought conditions that could decimate an already crippled Eastern Cape agricultural system. 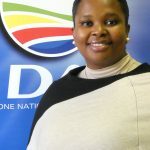 I will be writing to the MEC of Department of Rural Development and Agrarian Reform, Xolile Nqatha, to request details on what plans, if any, they have put in place to assist farmers in the face of an extended drought, as well as what steps they are taking to preserve the province’s scarce water resources and mitigate against water losses. An alert was issued that there is now a 70% chance of the El Nino weather system, which is centred over the tropical Pacific Ocean, occurring. This system, which last occurred in 2015, impacts weather patterns across the globe, and is known for causing longer periods of sustained heatwaves and severely reduced chances of rainfall in the Eastern Cape. This year saw large portions of the Eastern Cape declared disaster areas as a result of the drought, which has had debilitating effects on farmers, rural villagers and seasonal farm workers. The DRAR 2017/18 Annual Report, tabled last month, shows how the province already experienced a devastating blow to food production due to the severe drought, with maize production 26,849 tons less than expected. Fodder crops were also negatively impacted. An extended drought, combined with extreme summer temperatures, will also increase the risk of fires. These fires further impact on food production, as was the case in the Joe Gqabi district. The Eastern Cape accounts for a third of all livestock in the country and produces more than 50 percent of the world’s mohair. Many farmers have reported loss of livestock due to the drought and this will seriously impact on the long-term sustainability of these farms. The Democratic Alliance is concerned about the impact that an extended drought will have on farmers and subsequently, food security and employment in the province. If farms are not producing, there is a decline in demand for seasonal farm workers, which will further aggravate the unemployment crisis in the province. We cannot wait until there is a crisis, and then seek financial relief. We need to be proactive and ensure that effective, long term strategies are rolled out that will ensure the sustainability of the province’s Agricultural sector. ‹ Still no sign of Coega’s Annual Report – what are they hiding?